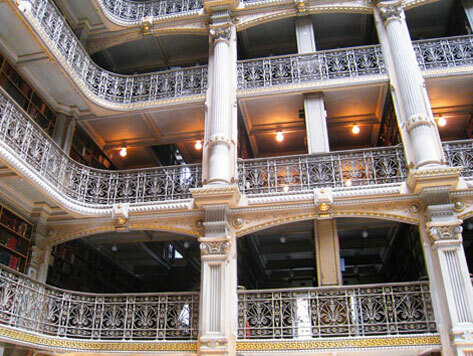 The Peabody Library, formerly known as the Library of the Peabody Institute, is a 19th century research library located on the Johns Hopkins University campus. The library was founded by local Baltimore philanthropist, George Peabody, during the early 1800s, and was designed to serve as a cultural center for Baltimore. The Institute is available for use by the general public, and features a main collection with over 300,000 volumes of books on religion, British art, architecture, topography, history, biography, geography, and literature. Considered one of the most beautiful libraries in the world, the Peabody Library is also a popular venue for parties and events. Parking near the Peabody Library is available at locations marked on the map. Parking at 520 North Charles Street is a short stroll from the library and Franklin Street parking offers pre-paid monthly parking rates.